Brad Camphouse, the Bearded Realtor, The Group Real Estate. 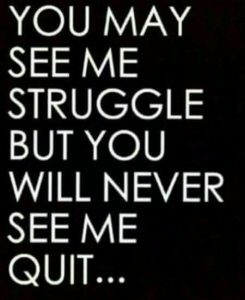 There is a mantra we love to use here at The Group Real Estate, in Idaho Falls, and that is this: Never Quit! I would like to start by asking you a question. Have you ever been in a position where you just wanted to say or you did say, “I Quit”. I want you to try and remember that moment when you were fed up with life. You were just done with dealing with whatever situation you had at the moment. The reason to think about it is so you can remember the feeling you had, in order to overcome it next time. I want to tell you a story about a young man around the age of 20. His lifelong dream was to become a Navy Seal. The training to become a Seal is some of the very most grueling training in the world. However this particular story is only about one event. Tying 5 different knots on to a pole underwater. The way it works is the young man in a pool that is about 10 feet deep. The instructor tells the young man a knot to tie by screaming “bowline”. The young man then swims down and ties the knot but then has to wait as the instructor also swims down to check to see if the knot is correct. They then both can come up for air. As they surface the instructor will give the young man his second knot, screaming “square” only giving the young Seal hopeful the time to get one big gasp of air and do it again. Now to become a Seal you only get 5 tries to get the 5 different knots tied. Fail and you’re out. This young man was on his 5 try. He was going down for his 5th knot, but before he finished the knot he drowned. The instructor is watching with a close eye and dives down to get the lifeless young man. As they get him to the top and begin CPR the instructor says this does not look good, he is really out of it. Finally after about a minute and a half the young man spits the water out of his lungs. The very first thing he asked the instructor is “did I pass, did I get my last knot?” The instructor then looks at the young man and tells him. “Son this test is not wither or not you can tie a knot under water, it’s about how far you are willing to push yourself and never quit. You killed yourself for it, so I would say you passed.” The point is not the task, the point is never quit. At the first of this I asked you to think of a time when you wanted to or when you did quit. Now all I ask is that you remember that feeling, when you feel like quitting which it will don’t quit right now, quit tomorrow. You are having a bad day. There is tomorrow. If you can get up out of bed, get dressed, brush your teeth, eat breakfast, then step out the front door and face the world, your winning. Focus on making it to lunch, then dinner, then back to your bed to start a new day tomorrow. Small victories lead to bigger ones. Keep moving forward.